Mike, Dog, Stanley and Frank are not only the pets of Billy, they are also the most-feared gang in the area. One day, when Billy is away on some school-trip, Mike, the dog, get's caught by the evil dog-catcher Ivan. His three friends don't hesitate and try to break into Ivan's dog-prison. Every of the three has his special abilities. 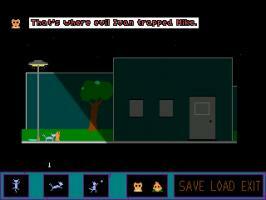 Dog the cat can jump, climb and throw things. He is also the strongest member of the gang. Frank the hamster can also climb. He is the only one who can carry something with him - just guess where. Stanley the turtle is the slowest member, he can hide inside his shell, what makes him almost undestructable. He also carries the option-menue. 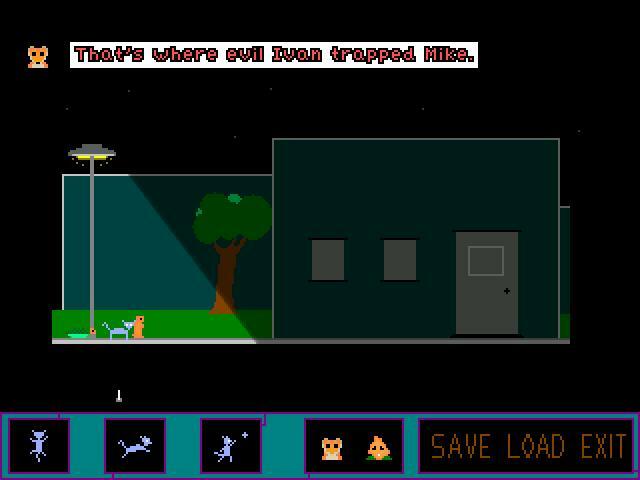 left mouse button: walk and use objects right mouse button: look at things Alpha Dog was designed, written, coded, and established with three powerful pieces of music by Flo Förster. Testing, speech-animations and lots of advice by Helme Burch. "Great look and feel, and awesome music. Although the game is buggy and rather not clear. The game showed a lot of potential." Hehe, great idea for a game, sort of reminiscent of Gobliins, where you get three characters with different skills. I found this game quite frustrating, but yet also quite rewarding. One of the puzzles was especially rather perplexing, but with time and thought, the answer did arrive. I disagree with the one cup rating, would go for two at least. Catchy tune, simple but nice sprites and animations. A very nice concept for a game, though I didn't enjoy the try-everything-on-everything type of puzzle, so I eventually gave up on it.